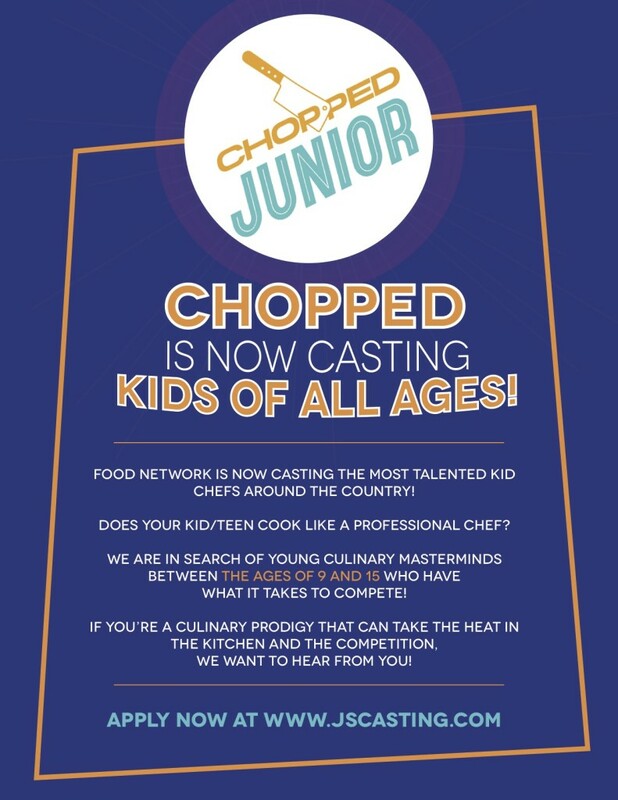 Food Network’s hit culinary competition “Chopped” is now casting for Chopped Junior. The show is on a nationwide search for culinary wiz kids who know they can take the heat in the Chopped kitchen and compete against other kids and teens for some great cash prizes. The show is casting kids and teens 9 to 15 years old nationwide. Season 1 of “Chopped Junior” will be premiering this month and season 2 is now casting in anticipation of next seasons episodes. 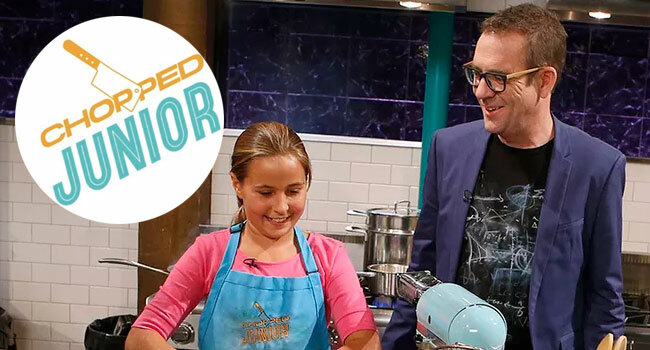 Food Network’s “Chopped” is getting a spin-off, “Chopped Junior.” The show will work just like the adult version except that the chefs competing will all be between the ages of 9 and 15. Chopped is a cooking challenge that puts 4 chefs into the kitchen where they compete in 3 challenges… the appetizer, entree and desert rounds. The cooking reality competition is not as easy as making 3 dishes though. Each round makes use of the “mystery basket” of ingredients which all chefs must use in their dishes. That “mystery basket” may contain anything from soda pop to chicken feet and chefs have to think quick…. the rounds are timed and each ingredient must be used, in a creative way, or risk getting chopped. After each round, one of the chefs gets cut until 2 go into the desert round after which a winner will be picked and awarded the “Chopped” prize of $10,000. If your kid or teen can actually cook and handle Ted Allen saying…. “I’m sorry, you’ve been chopped,” without tearing up… they may be a perfect match for the show. At stake is $10,000, just like the adult Chopped competition. “Chopped Junior” will premiere on the Food Network on October 27th. Is your youngster already an accomplished chef in your kitchen? Think your kid is good enough to compete against other kids who also have a knack for the culinary arts? If so, here is a chance to get them a spot in the Food Network, “Chopped” kids / teen competition. If your child has the culinary chops… there is a chance to walk away with some big bucks. Applying for the show is easy and casting directors have put up an online application form for parents interested in getting their culinary wiz kids onto the show. See the flyer below for the casting call information. Be sure to also check out all the other auditions for kids that may be going on in your area now. I’m Ella and I’m 12 years old. I would love to be on chopped junior for my parents and my great grandma who had recently died last year. My parents own a catering business and a wedding venue and they taught me really well. I know what flavors go well together. My parents have met Scott Conant, and, they have seen Alex Graundeshelli. I’m really hoping to win and I really wanna meet Scott and Alex. I’m hoping to win $10,000 for my family and my great grandma! I love to cook and I am very determined to win. I want to win chopped junior for my grandmother and for my family. My name is Jared Richards and I love to cook. I am 11 years old. I am from Paterson, NJ. Winning this money would be amazing for my family. So I would like to be on chopped jr.
I’m a good cook. I love to cook and I would love to be on the show. Also, I would use the 10,000 to buy a house for my mom and if there is any left, I would donate it to cancer awareness. Hi my name is Marlene Castillo. I’m a very competitive person and my passion is cooking my best, baking and making any type of deserts. I’m 13 years old and I would love to be on chopped Jr. I love to cook. Please pick me. I want to be on the show. My name is Gavin and im 14.
i would like to be on chopped because someday I would like to be the president of the food committee like my grandma, please, please choose me. I love to watch this show and I love to cook a lot of food. Hey my name is Ella I’m 12 years old, and, I have some experience with cooking because my parents are chefs, and, they own their own catering business called The Olde Farmhouse Barn, and, Pistachios Catering. They really inspire me a lot by teaching me how, and, what to learn to be on Chopped Junior. But my parents have seen Alex Guarnaschelli, And my parents have also met Scott Conant. I have been watching Chopped, and, Chopped junior since I was about 9 or 10. But I have so much experience with cooking, so I hope that you will choose me to be on Chopped Junior. I also want to win because I want to take me,and, my family on a trip somewhere out of state, and, I want to use haft of the 10,000 dollars for going to a Children’s Hospital,and, sing for those children that needs to stay strong,and, fight for cancer, but I want them to see/hear me sing to feel what’s it like to sing to other people. One more thing, I want to go to a Hospice Care Center called Butterfly Oasis, because my Grandma Eleanor had just passed away last year on the 21st of January, and, I heard that she passed away, because right when I was going to school that day my mom had told me that she had just did at 12:45am. Hey I’m so excited to be on this tv show! My name is Ella Minor and I’m 12 years old. I have brown eyes, and, blonde hair. My parents are caterers their business name is Pistachios Catering, and, The Olde farmhouse barn. I have been cooking since I was 5 or 6 years old cooking is my passion. My parents are fantastic cookers. I’m the oldest in the family my younger brother jack is 10 years old he really inspires me a lot and I love him no matter what. Hi my name is timbrie justice and I have love chopped jr. I can cook. hello my name is Dyseree. I am 12 years old and I have a knee disease. I cook and I have a lot with cooking. I would love to be on this show because I would like to prove to people that you can cook no matter if you are hurt or sick. When I was little I had to go to the hospital 5 times, it was very hard for me to learn but, shortly after that I kept on getting ear infections then I could not really hear anything. So this would be an amazing thing for me to show people you can do anything. with the 10,000 dollars I would donate some to children’s hospital and I would love to have a restaurant. I would love to be on chopped.jr. My name Islily Butim, not sure if I would be allowed, but I will give my info anyways. Hi, my name is C’anna Edwards, I’m 11 years old, and I absolutely love cooking. I also love making new dishes, and helping my mom cook dinner. I would love to be on this show, or just get a chance to be on this show, Thank you. I would love to be on your show, this is the only show I like. I love to cook it does not matter if I loose or win as long as I have fun. I’m a eleven year old girl and I’ve been cooking ever since I was four years old. I am still a very excellent cook. I can cook a whole thanksgiving dinner, Christmas dinner, EVERYTHING. And also I’m a FANTASTIC baker. Hi my name is Queens, my daughter really wants to be on this show. She know how to cook anything just name it. So can you give her a chance, she’s 9 years old. HI my name is Jill Edwards and I would love my 10 year old Haley Hitchens to be on the show. I think she would love to because she loves to cook. She is the best cook ever. I think you would love her. Hi my name is Amber, I am a mother of my 9 year old daughter Macie, she can cook anything, she can even cook pasta from scratch and it tastes wonderful and even if she’s young she can can win chopped junior. Hi,i’m Macie and I can cook I once made spaghetti from scratch and just because I’m young does not mean I can win and I would love to go to chopped. Hi I’m Mia Rowe, I’m 11 years old and I’m a very tough cookie and I can make a mean Yams and marshmallow dish. I have a great imagination which will come in handy when you have chicken and gummy worms. My name is Madyson Aiken and I would really enjoy the experience of being on chopped junior. I have been in love with the show since I can remember. I am 14 years old and I love to cook. I have such a deep feeling for cooking, that I have created and prepared many unique dishes in a homemade cookbook I have put together. Please consider me for this challenge, it would be an amazing opportunity. Thank you. I watch chopped Jr all the time and love to cook. I think this would be a great opportunity. I am writing to recommend Chef Daniel Doyle as a Judge on Chopped Junior. Chef Doyle has competed on Chopped. Although he was “Chopped”, he is an excellent choice for a Judge on Chopped Junior. Chef Doyle has the expertise to be a fair Judge, and he has the expertise as a parent, as well. I would like to suggest Chef Doyle as a Judge. You and your contestants will enjoy this talented gentleman! Thank you for your consideration. Not only is his responsibility Poogan’ Porch in Charleston,SC, but he has just become General Manager of a new venue by the name of Poogan’s Smokehouse, Charleston, SC. With best wishes for your success, I remain, Barbara Stratton. I would love to be on this show. I always wanted tube on chopped. I think I will win, please, please, please, consider me. This is an amazing opportunity. I would love to do this please. I would love to be onthis show. I put my application in sooooo many times, please consider me. I think I have the competition to win. I am 5 foot 1, dark brown hair, hazel eyes, 13 years old this is amazing, please.